The last time we looked at ultra-lightweight materials, we were thoroughly impressed by a spongy, metallic micro-lattice that held a density of 0.9 milligrams per cubic centimeter (mg/cc). Now, a team of German scientists from the Technical University of Hamburg and University of Kiel has developed a new carbon-nanotube-based material called Aerographite that’s four times lighter at 0.2mg/cc. As you might have surmised from Aerographite’s name, it’s a material made of mostly air--99.99 percent, to be exact--along with carbon nanotubes. 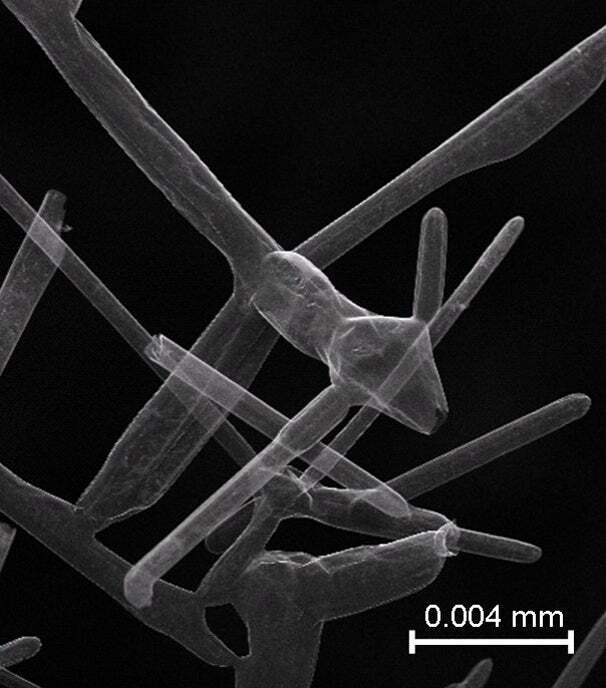 The scientists created the material by growing an interlinking chain of carbon nanotubes onto a zinc oxide template. Despite Aerographite’s lightweight nature, it’s actually quite tough. The material is robust enough to support 40,000 times its own weight. If you were to squish Aerographite like a sponge, it would just spring back into its original shape. The scientist tested this by compressing a three-millimete-tall piece of Aerographite down to a few hundred micrometers. Because Aerographite is electrically conductive and chemical-resistant, the scientists believe that the material could be used in ultra-lightweight batteries or supercapacitors. The material also has a few other interesting properties that make it hydrophobic, a good insulator, readily absorb visible light, and opaque to X-rays.